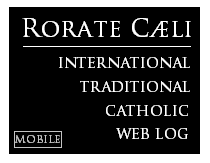 RORATE CÆLI: All Roads Lead to Washington, D.C.
All Roads Lead to Washington, D.C.
1) Bishop Michael Bransfield resigned and the resignation was accepted. Bransfield served for 24 years at the Basilica of the National Shrine of the Immaculate Conception in Washington, D.C., most of the time as rector. 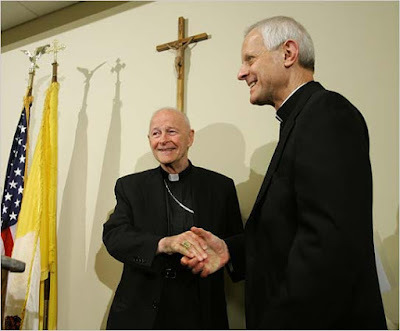 He was then ordained a bishop, choosing Theodore McCarrick as co-consecrator. 2) Archbishop William Lori, who ran the Archdiocese of Washington (D.C.) throughout the 1990s (holding several high-level positions, including moderator of the curia and auxiliary bishop), will investigate allegations against Bishop Bransfield. During Bransfield's time at the D.C. basilica shrine, Lori had oversight over Bransfield. (For instance, the Washington chancery instructs which bishops -- and even cardinals -- are banned from offering sacraments at the basilica shrine, a practice that still continues). 3) All this follows the scandal of Theodore McCarrick, former archbishop of Washington, who handpicked his successor in D.C., Donald Wuerl. The two men were the leaders of the movement to give Communion to politicians who openly dissent from Church teachings. 4) Cardinal Donald Wuerl has announced he will be going to the Vatican to discuss his resignation, which implies it will soon be accepted by Pope Francis. Not mentioned yet is Wuerl's membership on the Vatican's Congregation for Bishops, where Pope Francis chose him to replace Cardinal Raymond Burke just nine months into this papacy. Two Americans sit on the extremely prestigious congregation that selects all new bishops -- Cardinal Blase Cupich being the other. 5) The replacement for Cardinal Wuerl will be the next piece in this saga. It is presumed, given his Congregation for Bishops post, Cardinal Wuerl has handpicked his successor. 6) Cardinal Daniel DiNardo, president of the United States Conference of Catholic Bishops, based in Washington, D.C., is himself facing allegations of a priestly transfer and cover-up in his archdiocese. 7) Cardinal DiNardo and three other U.S. Church leaders held a meeting with Pope Francis today to discuss the scandals. As the Associated Press smartly observed regarding the four American representatives: "Among the four was (Bishop) Bransfield's cousin, Monsignor Brian Bransfield, secretary-general of the U.S. Conference of Catholic Bishops." 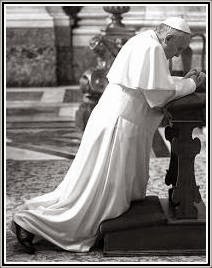 8) Pope Francis is convening a group of bishops in February to investigate themselves. The Archdiocese of Washington has, for several years, been a center-left jurisdiction controlled by a tightly connected mafia. Cross the middle to go to the left, like Jesuits in Georgetown, and you are tolerated until Rome speaks. Cross the middle to go to the right as a priest and you are suspended, transferred, removed, retired or even sent out of the country. Many of the pastors of large parishes have been priest-secretaries to the archbishops or otherwise extremely loyal to whichever cardinal is in charge, despite the open-secret atrocities committed we now know about. This will continue, even under a new archbishop in Washington, unless a massive housecleaning is accomplished, from the chancery on down. As one who was denied a job several years ago in the Archdiocese of Washington chancery (Deo gratias! ), after successful interviews and high-level recommendations, explicitly as a result of a code of mafia-like trust that could not be counted on, this writer guarantees nothing will change until all levels of staff -- priests and laymen -- are, at best, re-examined or, at worst, removed. Otherwise the mafia, with its secrecy and cover-ups, will simply continue under new leadership.